Southern Illinois University Press, 9780809326457, 264pp. “It’s Magic Time!” That colorful promise began each performance at the Caffe Cino, the storied Greenwich Village coffeehouse that fostered the gay and alternative theatre movements of the 1960s and launched the careers of such stage mainstays as Sam Shepard, Lanford Wilson, Robert Heide, Harry Koutoukas, Robert Patrick, Robert Dahdah, Helen Hanft, Al Pacino, and Bernadette Peters. As Off-Off-Broadway productions enjoy a deserved resurgence, theatre historian and actor Wendell C. Stone reopens the Cino’s doors in this vibrant look at the earliest days of OOB. 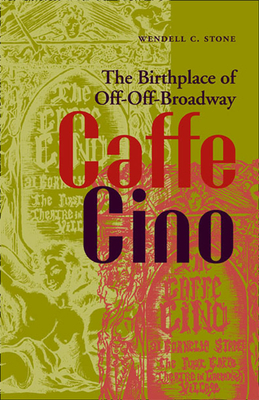 Rife with insider interviews and rich with evocative photographs, Caffe Cino: The Birthplace of Off-Off-Broadway provides the first detailed account of Joe Cino’s iconic café theatre and its influence on American theatre. A hub of artistic innovation and haven for bohemians, beats, hippies, and gays, the café gave a much-sought outlet to voices otherwise shunned by mainstream entertainment. The Cino’s square stage measured only eight feet, but the dynamic ideas that emerged there spawned the numerous alternative theatre spaces that owe their origins to the risky enterprise on Cornelia Street. Wendell C. Stone teaches in the Department of Mass Communication and Theatre Arts at the State University of West Georgia. His articles have appeared in Twentieth-Century American Dramatists, Text and Presentation, and Notable Gays and Lesbians in American Theater History.